Inset embossed logo and snake details. 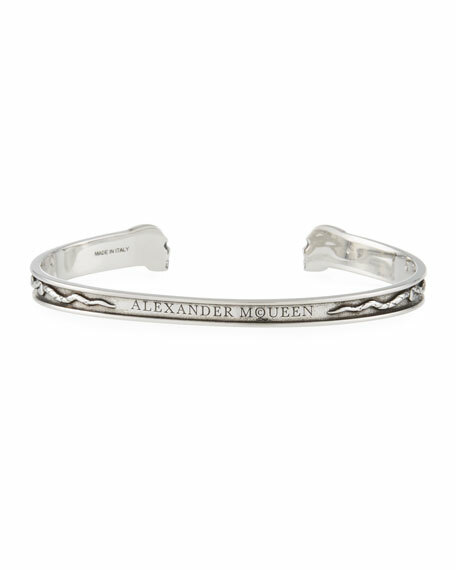 EXCLUSIVELY AT NEIMAN MARCUS Brace Humanity men's bracelet. Stingray shagreen cord. Golden-plated hook closure. 8"L x 0.3"W. Made in USA of imported material. Konstantino Men's Dare Sterling Silver Cross Bracelet, 2.5"
Konstantino men's Dare cross cuff bracelet. Intricate hand-etched sterling silver. Pinch box clasp. Approx. 2 1/2" diam; cross measures 1"W.
Konstantino men's Dare cross cuff bracelet. Intricate hand-etched sterling silver. Pinch box clasp. Approx. 2 1/2" diam; cross measures 1"W. Handmade in Greece.